Thread: Scrappy wall hanging finished! Stained glass effect. I was inspired by this pattern someone else posted on the board. My plan this year is to use up a good part of my stash, but this one really didn't make a dent in the piles of fabric! I didn't know the measurements, but I knew I wanted to try it just for fun. It's about 33" square and still needs to be quilted. I can't decide whether or not to put a border on it. I kind of like it "as" is and plan to hang it in my sewing room. It will definitely brighten up the wall. I love the controlled scrappy...and the black sashing is super. What is the measurement of the largest piece in the block? Nice project, and great fabrics! Really pretty, and a wonderful grouping of colors. I love the way you used the colors. It is a beautiful quilt. I am sure you will enjoy it in your sewing room. Lovely and I agree to not using a border to keep the modern look. I've seen this pattern several times recently and REALLY like it.....but the way you did it with the colors put together in "blocks" is different than the others i've seen....and i like it even more. Thanks for sharing. I love this. I know you didn't ask for opinions, but I'll give mine anyway. I like it as is. No borders. Very pretty. What a great way to use up some scraps! I think it looks great without a border. So nice! I love stained glass and this is so realistic looking. Ohhh. It is so pretty! Great job! I cut the largest square at 6 1/4", the second largest is 4 1/2" The black sashing was done with 1" strips. 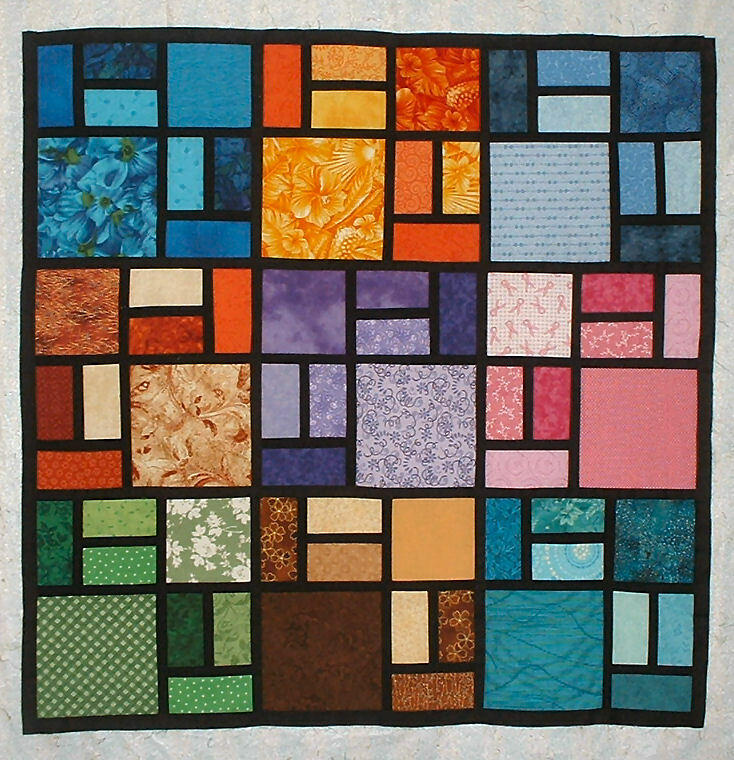 I wouldn't put a border on it to detract from the beauty of the quilt. Great color selections !! Very pretty and the colors just go so well together! Really pretty colors and arrangement of the colors. I too like it w/no additional borders.